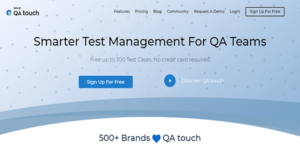 QA touch is a freemium test case management solution that revolutionizes QA processes with its inclusion of AI technologies. With a smart feature, you receive intelligent suggestions and predictions for your text. As a result, you can write about test cases and issues faster, saving you and your QA team time. QA touch is budget-friendly, too, despite its robust capabilities. It has economical monthly plans and it even offers a free package for small teams. This way, you can conduct your QA processes without worrying overly much about the operational cost. Thus, you can produce top-notch results and high-quality products in a short amount of time and in a cost-effective manner. With QA touch, writing about test cases and issues is faster. It is not just because of its intuitive interface, but it is also because of the solution’s AI text predictor. This function provides smart predictions of what you are going to write next, enabling you to save time writing about problems. This is a feature unique to the platform, which can transform your workflow. Making test management intuitive is a mission of QA touch. To that end, it provides a comprehensive module that allows you to plan, execute, and measure your test management processes. QA touch has a pre-made integration with Jira. This way, you can log issues, prioritize tasks, and assign jobs to team members directly from the platform. On top of that, this functionality allows for the seamless population of data from your Jira account. A built-in bug-tracking component adds to the value of QA touch. This lets you save time from switching between different software windows and it allows you to save on costs too. Moreover, this lets you create a bug ticket wherever you run your test scenario, making bug tracking less arduous. Keeping track of QA activities is easier with QA touch. The solution lets you generate reports specific to projects, versions, test cases, and issues. With these reports, you can determine the productivity of your team and find ways to improve their work pace and quality. On top of that, this feature lets you know which test cases failed and affords you the ability to track them until closure. Moreover, if you need reports with specific elements, the solution can provide it to you, too. What Problems Will QA touch Solve? QA touch can store everything that pertains to project requirements, test cases, and issues. This allows you to map test cases with requirements and to build a Requirements Traceability Matrix automatically. By affording you the ability to track issues within the platform, QA touch can help you transform team collaboration. When typing is cumbersome, QA touch lets you create audio records of issues. This way, your team can track and fix bugs while making audio reports. If you are interested in QA touch it might also be beneficial to check out other subcategories of Best Test Management Software collected in our base of SaaS software reviews. Companies have unique wants and requirements and no software platform can be perfect in such a scenario. It is futile to try to find a perfect off-the-shelf software app that meets all your business wants. The wise thing to do would be to modify the application for your unique requirements, employee skill levels, finances, and other aspects. For these reasons, do not hurry and subscribe to well-publicized leading solutions. Though these may be widely used, they may not be the ideal fit for your particular needs. Do your homework, look into each short-listed application in detail, read a few QA touch reviews, speak to the seller for clarifications, and finally choose the app that presents what you require. How Much Does QA touch Cost? QA touch offers three plans with enterprise pricing as well as a free package. The inclusions of these are listed below to help you come to a decision. We realize that when you make a decision to buy Test Management Software it’s important not only to see how experts evaluate it in their reviews, but also to find out if the real people and companies that buy it are actually satisfied with the product. That’s why we’ve created our behavior-based Customer Satisfaction Algorithm™ that gathers customer reviews, comments and QA touch reviews across a wide range of social media sites. The data is then presented in an easy to digest form showing how many people had positive and negative experience with QA touch. With that information at hand you should be equipped to make an informed buying decision that you won’t regret. What are QA touch pricing details? What integrations are available for QA touch? If you need more information about QA touch or you simply have a question let us know what you need and we’ll forward your request directly to the vendor.